1. The Quickbooks Name field in Administration/Maintain Clients must be filled and it must agree exactly with the Customer Name of your customer in Quickbooks. In the following diagram, you will see 'Central Hospital' in the Quickbooks Name field. This agrees exactly with Customer Name in Quickbooks. Do not use special characters in Quickbooks Customer Name like ampersands, exclamation points, questions marks, etc. They don't transfer well. Better to have a space in the name. i.e. 'Central Clinic & Hospital' will not work. Better to have the name as 'Central Clinic and Hospital'. 2. 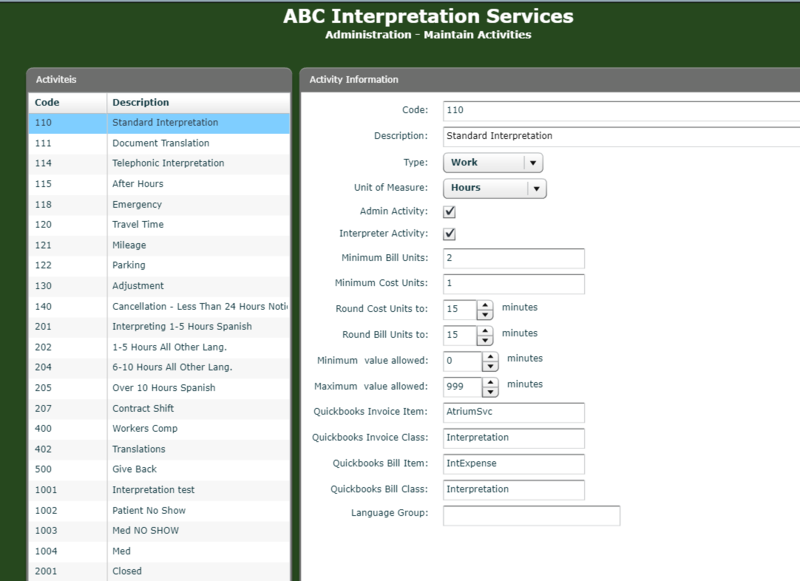 The Quickbooks Vendor Name for each of your interpreters must match the concatenated First Name and Last Name (with one space in between) or Last Name, First Name (with comma and space between). Make sure there are no preceding or terminal spaces. The Class fields are optional. If you do not use classes in Quickbooks, you may leave those fields blank. Do not confuse Item with Account. The Quickbooks Invoice Item links to an income account and the Bill Item links to an expense account. What accounts you use are up to you. Since the Class is not a specific account, you can use the same class for both Invoice and Bill Class. 4. LSP Ware will send you a small file which you will need to run in Quickbooks Web Connector. The Quickbooks Web Connector comes with Quickbooks, but it never hurts to make sure you have the most recent version. To do so, go to http://marketplace.intuit.com/webconnector/ and download the latest. This is an application that runs in background. You configure how frequently you want it to contact our web service and check for transactions to be transferred. It will look like this after you run it and add the file LSP Ware sends to you by clicking the Add an Application button. You will need to add a password, although it does not matter what that password is. We use a different method securing this application that is more reliable than a password. 5. The final step is in LSP Ware's hands. We need to modify your configuration so that Quickbooks Integration - Desktop (QBD) is enabled. When all of the above is accomplished, it should work just fine.